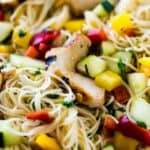 Somen Noodle Salad with grilled chicken is a light and crisp meal that is perfect for potlucks or a casual one-bowl weeknight dinner. Combine lime juice, olive oil, sesame oil, soy sauce, gingerroot, garlic, sugar and red pepper flakes in a bowl and whisk to combine. Place chicken in a ziplock bag and pour 1/4 cup of the dressing over the chicken, close bag and marinate in the refrigerator for at least 3o minutes before cooking, up to 3 hours. Reserve remaining dressing. Drain chicken, discard marinade, season with salt and pepper and grill chicken for 5-7 minutes on each side over medium heat, until a thermometer reads 165 degrees. Meanwhile, cook somen noodles according to package directions, drain and rinse in cold water. Combine bell peppers, cucumber, parsley and onions in a large bowl. Cut chicken into strips and add pasta and chicken to the vegetable mixture. Toss salad with the dressing just before serving.